Provide technology leadership and solutions to business units and residents in support of effective City and utility operations, robust community engagement, and a thriving local economy. To learn more, read the IT Department's 2017-2021 Strategic Plan. For a brief overview, see the Strategic Plan poster. The City’s Information Technology department provides resilient Information Technology (IT) infrastructure for City operations, provides business applications for management of information, and supports City departments and utility divisions in digital initiatives for residents and customers. The IT Administrative & Business Services Program provides for IT service management (including service level management and performance management), asset management, program management, information systems governance, and strategic planning. The program administers product licensing and commercial support services for the City’s IT operations. The program provides financial management services for the IT department, including budget, rate and assessment modeling, management of inter-local business agreements, and customer billing. This program also manages IT organizational development, team member recruitment, professional development, employee performance management, and labor relations. The Cybersecurity Program establishes and monitors appropriate information security policies and architecture for the organization in accordance with City goals, business objectives, risk tolerances, and regulatory compliance requirements. The program increases organizational awareness of informational security threats and employee responsibilities. The Cybersecurity Program also establishes and monitors appropriate information systems controls to protect against data loss, disruption of City services, and other misuse of City information and technology systems. This program manages ongoing risk analysis in consideration of dynamic cybersecurity threats. 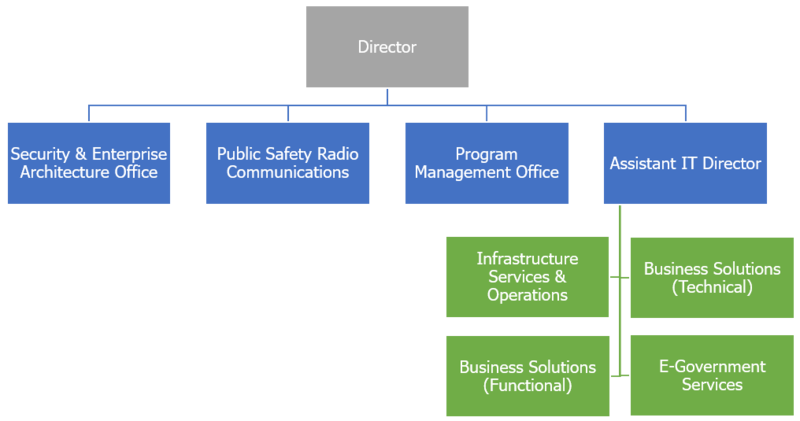 The Technology Infrastructure Program ensures appropriate infrastructure and secure communications environments for all City departments and provides telecommunications, public safety radio communications, end computing devices, Wi-Fi services, private data networks, data storage, systems hosting, and internet access. The Technology Infrastructure Program also provides help desk services for all City employees and 24/7 technical support. The Enterprise Applications Program provides business applications support and business process automation for all City departments. This program provides software services for the City’s Enterprise Resource Planning, Customer Relationship Management, and related enterprise systems. IT services provided under this program include business and systems analysis, software development, testing, implementation, training, and support for Citywide software applications. The E-Government Services Program provides digital government services and web support for all General Government departments. Specifically, this program provides technology solutions and support enabling online payment processing, citizen service requests, open data, and access to Geographical Information Systems (GIS) data and applications. The Information Technology Department is currently developing a Digital Equity Program, which will focus on improving access to the Internet for underserved areas of the community, promoting digital literacy skills-building for Tacoma residents, and ensuring that the City’s digital government services are sufficiently designed to reach all community members.